A lot has been happening here at Ribbon and Bow HQ. The website has finally launched and we had our Christmas market experience. But first, can we take a minute to celebrate my first blog post?! As you may know, Ribbon and Bow is a Prince’s Trust supported enterprise. They do a great job in helping young people achieve their dreams. Through the Prince’s Trust we were able to showcase our lovely gift boxes to the Clear Channel team at their Christmas market event last week, at their quirky Central London office. Our stall was very festive – you couldn’t miss it! As well as the mince pies going for free, I had the popular Starry Night and Littles gift boxes on display. Also available to purchase were some beautiful items that feature in a selection of the boxes. The Bloomtown Botanicals face masks were a firm favourite as were the positive cards which can be found in the Motivation gift box. The lovely staff made us feel more than welcome, as they browsed the stalls admiring the unique items. Most were very interested in the concept of Ribbon and Bow, asking how I came up with such an idea. I had a great chat with Katrina who recently got married, she told me about her experiences as a new bride. She mentioned that she received tons of curated gift boxes as wedding gifts, however they were all very similar. Although they were gorgeous, they all included the same things; body wash, body lotion… the usual. “What was I supposed to do with all that body butter? !” she asked. I handed her the iPad and she took a look at our unique Bride boxes online. Immediately she had a YAAAASSSSSS moment. She commented on how our boxes were exciting and practical. I was so happy that she got it! She understood exactly what Ribbon and Bow stands for. Meeting and chatting to customers had to be the highlight of the day. It was lovely knowing that a lot of the items purchased were going to be given as Christmas presents and would put a big fat smile on someone’s face. Although I was a bit nervous in the lead up to the pop up, I quickly felt right at home. One thing I would say is that no matter how prepared you think you may be, you can never be 100% prepared – things just have to go with the flow. 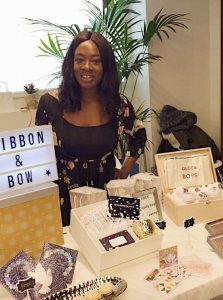 I’d love to know what your first time pop up, pitching and selling experiences have been like? What would your advice be to anyone preparing for their first major gig? Roll roll on the next pop up!